The push handle; the disc is closed against the seal when the handle is at right angles to the process line. 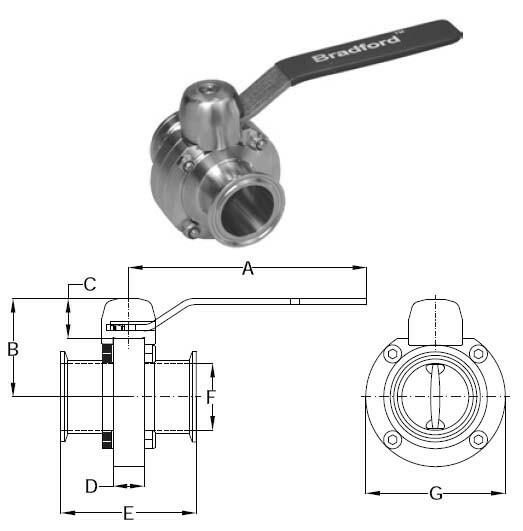 The valve is fully open when the handle is turned 90° and is parallel with the line. 100% tested / 100% inspected. 100% pressure hydraulic tested for reliability. Wetted surfaces polished to 3-A standards. Various end configurations available: weld, I-line, Q-line, bevel seat and John Perry. Actuation available: double-acting, air-to-spring, electric. Vacuum rating: 14.2 PSI at 68°F. Temperature range: 15°F to 200°F. Clamp style is standard.